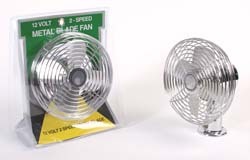 Twelve volt, two speed metal base fan gives you greater airflow output. Designed for heavy off-road use. 1 per pack.